On May 29, 2014, we Drove to Macon and scouted out two addresses where Thomas and Mamie Stasey had lived during the fifties. Both houses were gone. We went to the Blees Academy building and visited the Macon Historical Society Museum. We did some genealogical research in the Society’s genealogical room, and made copies of some Macon High School Yearbook pages featuring Mel. We also made copies of some Rural School Handbooks giving names of teachers and some of the students at Bohannon School during the years we attended. The handbooks appear to be published in the year after the event making it appear the teachers listed taught in the year after they actually taught. John Klusman and Merlyn Amidei gave us tours of the historical society. They have a fascinating collection. Merlyn has written two books on the history of Macon City and Hudson, a precursor community, "The Couch Potato's Guide to Macon City and Hudson," volumes I and II. The Macon Historical Society has an excellent web site, including a photo gallery, that will give you a good idea of its holdings. You may have to refresh the browser to get the photo gallery to display properly. The Museum was very well done. 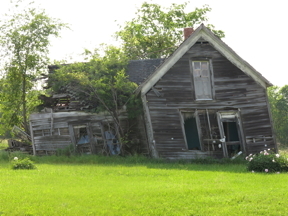 Lot’s of relics from the surrounding area including the reconstructed Shockey Mill (wheat and corn) which was formerly located someplace around Woodville. It might be the mill where we had grain processed when we lived there. We went down in the basement and saw the barred cells in which the violent were held. 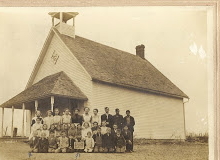 Saw a picture of the old T. A. Stasey filling station in Anabel, evidently from before Grandpa owned it. 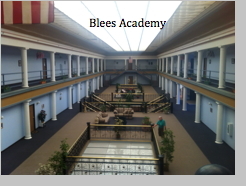 After leaving the museum we walked through the main building of the Blees Academy (former sanitarium where Grandpa Stasey worked). We drove around Macon for a while, visiting the Franke Photography and Jewelry shop where we purchased two books of historical photographs. We stopped by the West Book store and bought a copy of Becky Grady’s book on the black soldiers buried in the Macon Cemetery. Took pictures in the Miller Drug Store. 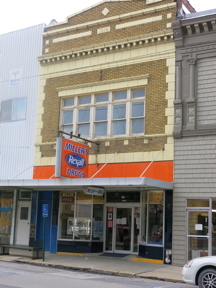 The Miller Drug Store looks remarkably similar to my memories of it in the 1950s. 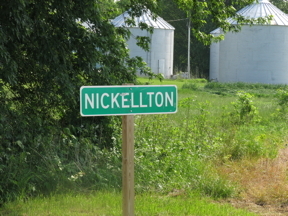 We sought and finally found Nickellton, Missouri where the Mount Olive Cemetery is located, but we were unable to find the cemetery itself. There was little evidence of a town beyond the sign an a few past-their-prime houses. We stopped by one of the few occupied houses in town to ask directions. We told the lady of the house we were looking for the Mount Olive Cemetery, she asked whose grave, specifically, we were hoping to find, we told her and she exclaimed, "Oh! Uncle Tom!" The house turned out to be owned and occupied by Shirley Borron-Webber and her husband Benny, cousins to both us and to Donna McMichael. Shirley is the daughter of Willie Borron, son of Archibald William Borron, brother of Adriana Borron. They graciously invited us in and we had a very long and pleasant chat. She knew little about family genealogy but did remember having heard of “Uncle Tom” Stasey and Aunt Adriana Borron Stasey. We were surprised to learn they had celebrated their sixty-fourth wedding anniversary the day before, May 28. They were the second couple we’d met on the trip sharing our anniversary day. They directed us to the Mount Olive Cemetery but we were still unable to find it. 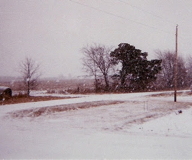 Inspection of the cemetery location on a satellite view reveals it is off the road and obscured by a tree line. The church that once stood nearer the road has been torn down. 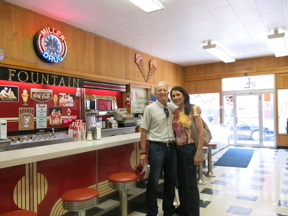 Willie Borron is mentioned on a blog kept by Cousin Shirley's sister, Charlotte. There are three references to Willie, telling how he saved the Nickellton school. We never did find the cemetery and returned to Hannibal where we had dinner at the Golden Corral again. On May 30, 2014, we flew back to Austin.